When it comes to accommodations in Toronto, two things immediately come to mind: leasing an apartment or staying at a hotel. However, depending on one’s needs, budget and length of stay, it could be that neither of these are ideal. In addition to location, size and other criteria, there are numerous options to consider for those that find themselves in Toronto for that period of time somewhere between just a few days and 1 year or more. At both extremes, the process is relatively well defined. At one end, renting a hotel room for just a few days is usually the simplest option and can be achieved relatively quickly. The main downsides here for most people are the lack of a kitchen and the high prices of Toronto hotels. At the other end, for stays of 1 year or more, this is where most apartment owners will be marketing their units. The search process will of course be a bit longer, but someone searching for a long-term lease can engage the help of a licensed realtor to streamline the process. The main downsides here for most people are the leg-work involved in bringing in furniture and setting up all the usual utilities (including television, phone and internet), and some of the hoops one might have to jump through in order to finalize a lease agreement (background/credit checks, employer letters, references, etc.). In between those extremes, there is a large “gap” in the market where one must wade through a variety of very different (and not always well-defined) options. Traditionally, the options in this “gap” have consisted of renting a furnished room (with access to a kitchen), subletting an entire apartment (for example, from a vacationing owner) or requesting a long-term discount at a hotel or motel. The quality and suitability of any of these options can be hit-and-miss. For example, renting a furnished room in a house or apartment, while likely to be cost-efficient, can come with a host of privacy issues. Subletting an apartment can also be cost-effective, however finding a sublet that meets your needs with move-in and move-out dates in-line with yours can be difficult. Lastly, choosing to stay at a hotel for a few weeks (or months) would provide the most options in terms of location and quality, but the lack of a kitchen and higher prices could still be an issue. – The amount of leg-work involved in finalizing an agreement can be significantly higher with an inexperienced owner looking for credit checks, references, etc. – Standards with respect to furnishings and equipment inside the apartment can vary widely when dealing directly with an owner, while a professionally managed apartment is more likely to be subjected to stricter quality control. – The level of service and support provided can vary widely when dealing directly with an owner, while a professional property manager is usually more accessible and responsive. Price – renting directly from an owner is typically more cost-efficient. Although the cost of a luxury furnished apartment is much lower than a comparable hotel, it could be higher than one of the other traditional short-term solutions, such as subletting. However, as the number of these apartments being offered in the city grows, prices are becoming more stable and the process of arranging for a luxury furnished apartment continues to become more well-defined and streamlined. With a professionally managed apartment, the booking process is similar to that of booking a hotel room, with the exception that an up-front deposit might be required. The perks being offered during one’s stay are also improving, including cleaning services and access to professional management staff 7 days a week. Who would need a furnished apartment in Toronto? Clientele in this market can include families relocating to Toronto, professionals coming to Toronto for an assignment or training, film / television cast or production staff coming to Toronto for work, expatriates returning for an extended visit, people who find themselves in transition between selling and buying a home and anyone else looking for great value and a short-term hotel alternative. The owners of these furnished apartments can range from large well-known builders who retain some of the units they build for these purposes to individuals owners who market their units either directly or through a professional property manager. For a builder, the on-going rental of these units represents a constant and relatively steady stream of cash-flow, which helps to offset the volatility they face in their main line of business (developing and selling real estate). For an individual owner looking to increase the amount of cash-flow being generated by their investment property, this furnished market can be a great alternative to the traditional unfurnished long-term rental market. Of course, the old adage about risk and reward going hand in hand applies here as well. 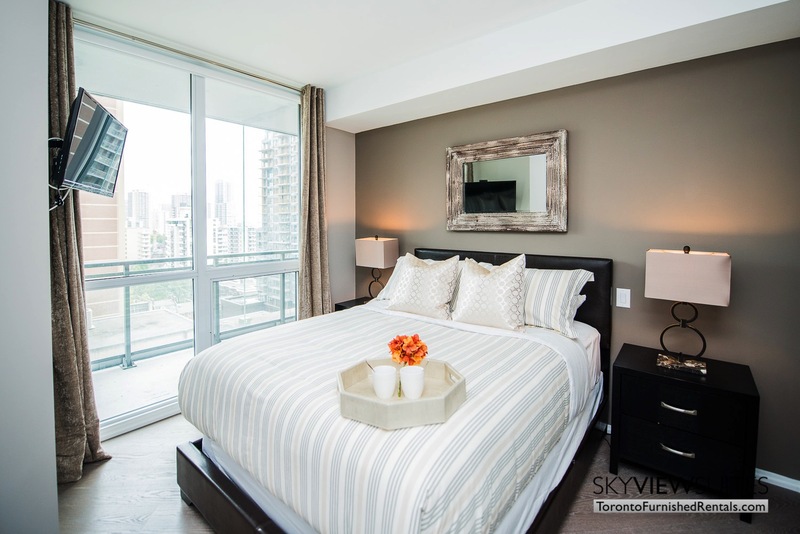 Given the right location (for example, downtown Toronto), a luxury condominium can generate almost double the rent when marketed and managed as a furnished apartment. Obviously, with this increased “reward” comes with additional risks, including seasonal volatility and a slightly overall lower occupancy rate. For an owner who is new to the furnished market, their best course of action would be to engage a professional and trustworthy property manager. A competent manager should be able to navigate the market in such a way as to manage the risks and minimize vacancy to no more than 5% (or less than 3 weeks per year).